Am I really writing a post about the mystery novel Veronica Mars creator Rob Thomas recently penned about the characters in one of my all-time favorite shows? Why, yes. Yes I am. It’s basically legitimized fanfic, and I happily shelled out 6.99 for my chance to spend a few more hours in Neptune, post-movie madness a month ago. Maybe I should be embarrassed about this. Some people have certainly told me I should be, but what’s the point? Why should I fight my love of all things Veronica Mars? Why should I pretend I don’t like fanfic when sometimes it’s the absolute best thing ever? I still remember the reams of paper my best friend and her sister used to print out fic written about Ghostbusters. That was back before the internet was a thing, at least for me; I honestly had no idea where they were getting these stories, and I didn’t care. All I knew was that for the low, low price of nothing, we could stay up late reading new adventures with our favorite characters. Today, of course, the world of fanfic is a bigger deal. The internet has made it possible for anyone with an idea to not only pen as many stories as they want about characters and worlds created by others, but to share them easily with an ever-expanding audience. I happen to think that’s wonderful. I know many people – even some of my favorite authors – look down on fic, or call it unoriginal and derivative, but I see it as an opportunity for people who might never have written a word to share in a feeling of creation. Writing a story is empowering. When I finish a book, when I’ve pulled it all together and had that internal click that tells me I’m done, it’s the best feeling in the world. I’ve gotten it writing original characters, other people’s characters, essays, dramas, poetry (you name it, I’ve probably given it a shot), and each time is special. I would never want to rob another person of that feeling. I would never want to tell another person that what they write or read is bad, or wrong, or shameful, even though it’s not always easy to own up to what I like best. I’m sure my perspective has been at least in part shaped by the fact that of my three closest friends, one reads mainly fanfic, one, the biographies of politicians and humanitarians, and one, romance novels; my father likes history best and my mother, genre novels and children’s books. I grew up surrounded by people who said yes to reading in any and every format. There were no restrictions about what I could or couldn’t read, no talk about what was “appropriate” reading material. All around me were true book lovers, people who understood that what made a book “good” was the reader’s pleasure in the experience. So when I tell you that The Thousand-Dollar Tan Line was good, I mean it was a joy to steal minutes out of my day to read it. I fell back into a world I’ve loved since the very first episode of the show aired (I still vividly remember being terrified and intrigued by one of the flashbacks on that show that night). Back then, my friend and I had a standing date to watch it; conveniently, it came on right after Gilmore Girls, so we would pour ourselves bowls of Cocoa Puffs for dinner (I know I’m old because that sounds like an awful supper to me now, but at the time, it was perfection) and settle in for two glorious hours. Of course, it’s important to recognize that Rob Thomas isn’t exactly borrowing these characters. He made them, and brought them to life, and was instrumental in bringing them back to fans years after cancellation, but he didn’t do it alone. The characters have been shaped by the actors and by the history of the show (undoubtedly built by a team of talented writers). He has been a guiding force in that world though, and his love for both the people he’s worked with and the characters he helped to create is always evident. He also has a gift for creating compelling mysteries, a skill I’m studying closely as I work on my own project. I genuinely have no idea how his characters read to someone unfamiliar with the series, but for fans – new or old – to Neptune, this book is a giant hug from him to you. When I was visiting my family in January, I gave my brother (as a belated Christmas gift) a kindle loaded up with books from my Amazon library. After flipping through the titles, he noticed that I had the Flavia DeLuce series, and he got excited because the newest one was due to be released the following Tuesday. He asked if I thought I would buy it, and I told him not to fear – it was pre-ordered and would be waiting for him come 12:01am. What I was thinking then though, and what I haven’t been able to stop thinking about since is that I can never remember, in all my life, reading the same book as my brother. I’m sure there has been overlap that I’m not aware of. If I looked back through books we both had to read in school for instance, or considered books our parents purchased which we pulled off the shelves for our own enjoyment, I’m sure there would be a few. Also, I could count the books we read aloud as a family at dinner, but I don’t because that was an entirely unique experience (not “unique” as in no one else has ever done it, but rather, a unique opportunity for our parents to share books mainly of their choosing with us). The thing is, I can’t recall a single instance of us discussing a book that we both read, loved, and were a little giddy over. It just hasn’t happened before, which is a little weird considering how much we both like to read. The thing is, this was an awesome discovery. I loved how his face lit up when he realized he could read the rest of the series, and for me, it felt like Christmas morning to be able to talk to him about the books without having to explain the premise or justify exactly why they were fantastic. It was a little surreal, actually, and the end result was that I really savored this latest installment. I wanted to prolong that feeling of kinship, and in doing so, I was drawn into the struggle, in this book especially, between Flavia and her sisters. The tension, the pull between them, and the love that exists just beneath a troubled surface becomes increasingly more central to the Flavia’s story. It seemed a reasonable question. After all he had been through, surely Dogger knew something of hopeless situations. “We shall wait upon tomorrow,” he said. “And so forth?” I asked. “And so forth,” Dogger said. For more about Alan Bradley, head here. There is definitely something distressing about reading a book about sleep-away camp in the dead of winter. The very quality of sunlight mocks the idea. Summer? Ha! There is no summer here, and it will be months before those dark, bitter mornings and soul-suckingly short afternoons begin to fade into the soft melody of spring. And yet Fun Camp is the book I chose halfway through January – or as I like to call it, the longest month of the year. What can I say? Amazon knows me too well. It’s like I’d already told it about all those summers I spent hundreds of miles from home, subsisting on peanut butter and jelly sandwiches and the care packages all the nice parents (mine included) sent. One year, of course, was bad (I believe it was just after seventh grade, but it may have been just after eighth – thankfully, all those awful junior high experiences sort of blend together after a while), but mostly, I adored that precious week of independence every year with a near religious fervor. In fact, I remember wishing that my parents could send me away for a month at a time because I enjoyed hiking and making ugly crafts and singing songs around the campfire so much that one week was just not enough for me. As an adult, of course, I realize that camps are pricy, and if I had gone to an awful one for four weeks, I’d probably still be lugging that emotional baggage around. Basically, I saw camp as a chance to escape being a bratty little sister for a few days while doing things that freaked me out (trust falls, eating questionable looking meat, kissing boys) in a safe but less supervised environment. Fun Camp is a look back at that experience through the slightly jaded perspective of adulthood. Durham’s book is a mix of speeches, letters, and one-sided conversations from narrators we only really get to know through biased and often ridiculous excerpts. It isn’t a novel, per se, although it does tell its own fractured story. Durham’s perspective occasionally borders on hostile, although it’s tempered with moments of unexpected joy, and his sense of humor is spot on. He ultimately does the experience justice, and by the end of the book, I felt myself transported back to the hot, buggy days of my youth. There were the boys who thought they were really getting away with something because they didn’t shower, the stupid pranks that often ended up with someone in the infirmary, the surprisingly passionate best friendships that burned out as quickly as they had ignited. For more about Gabe Durham, go here. It’s been a good long time since I’ve read a middle-grade novel I would recommend as highly as I would Wonder. This is one of those books, though, that I want to see in every school library and classroom. I want it to be on required reading lists for fourth, fifth and sixth graders. I want to be sure that it’s one of those stories that gets talked about and remembered by young readers, so for the many of you out there in the position to make that happen – get on it! Maybe I’m crazy, and there are actually hundreds of incredible books written for children that age, but back in the day, I scrounged for anything out of the ordinary and mostly ended up with formulaic novels featuring blonde, shiny protagonists. Now, there’s nothing inherently wrong with blonde, shiny protagonists. They have a right to the same amount of shelf space as anyone else. The problem is, most people are not blond or shiny – even fewer are both – and yet books are absolutely chock-full of peppy, winsome people with unrealistic issues. Tell me the truth: have you ever asked a person what one time he or she would never choose to relive? I have, on a number of occasions, and the answer is always the same. Junior high. Those three or four years in between the innocence of elementary education and the ignorance of high school are no man’s land. The kids experiencing them just want to get out alive, and those of us who have made the journey look back with a shudder of relief. Back then, I had a face (with braces, and glasses, and some horrific bangs) that only a mother could love. I think I most closely resembled one of the troll doll key chains I insisted on carrying around, and my personality did not make up for the fact that I was also chubby and uncoordinated. Do you know why? It’s because children that age are short-sighted, insecure, and frightened – even the nice ones! Even the ones who turn their homework assignments in on time and win trophies in soccer! Even the ones with tidy handwriting and perfect attendance! The beginning of puberty just kicks itself up into a tizzy and turns pleasant children into sullen, explosive, sneaky preteens. And guess what? We still have to love them in this phase, and part of my definition of love is finding books that make kids going through tough times feel better. 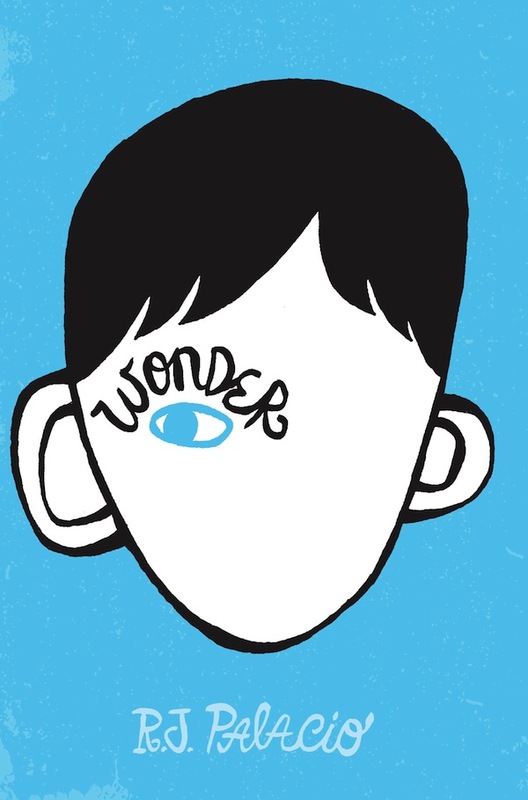 Wonder is one of those books. It’s written from the perspective of five people, although the central character is August Pullman, a ten-year old boy born with an incredibly rare combination of genetic disorders that lead to his having a painfully deformed face. The story winds its way through his first year attending school after having been home-schooled for years; while the fifth grade is difficult for everyone, this bright, kind child has been dealt a particularly rough hand, and his problems are the type that cannot be hidden from prying, judgmental eyes. i can’t sleep tonight. my head is full of thoughts that won’t turn off. lines from my monologues. elements of the periodic table that i’m supposed to be memorizing. theorems i’m supposed to be understanding. olivia. auggie. miranda’s words keep coming back: the universe was not kind to auggie pullman. i’m thinking about that a lot and everything it means. she’s right about that. the universe was not kind to auggie pullman. what did that little kid ever do to deserve his sentence? what did the parents do? or olivia? she once mentioned that some doctor told her parents that the odds of someone getting the same combination of syndromes that came together to make auggie’s face were like one in four million. so doesn’t that make the universe a giant lottery, then? you purchase a ticket when you’re born. and it’s all just random whether you get a good ticket or a bad ticket. it’s all just luck. For more about RJ Palacio, head this way. So, I never do this – I have a policy against doing this, in fact – but just this once, I’m going to break the rules and talk about a book I didn’t finish. I think it goes without saying that it’s also a book I didn’t like very much, but I want to be clear about something up front: this is an exceptionally well-written novel. My not liking it has absolutely nothing to do with Pessl’s talent, her dialogue, pacing, or plot. I genuinely believe this is a book worthy of all the acclaim it has received since publication. The only reason I feel I can talk plainly about what didn’t work for me in this novel is because I would recommend it to any number of friends without reservation. It’s actually painful to me to start a book, to get halfway through 514 pages and decide that I just need to stop. Part of me desperately wants to keep reading because the story is surprising, and I’m genuinely curious about where the author’s going with it, but a larger part – the part that has been wrestling with this book for the better part of a month – is ready to surrender. I have to come to terms with the fact that, as much as I like her stylized writing and wit, I cannot stand a single one of Pessl’s characters, and it’s impossible for me to go on with them. I have a quirk when it comes to entertainment, and it’s not something I think I’ve mentioned here before, namely because it precludes my enjoyment of whatever I’m reading or watching to the point that I stop. I try not to review things that I actively hate, so it stands to reason that I’ve never written about a book filled with characters – well-developed, perfectly reasonable characters – who talk and act and think in a way that is so uncomfortable to me that I get no joy from following them to a resolution. The first book I remember feeling strongly about in this way was The Catcher and the Rye. I was tremendously excited to read it at the time (I was fifteen), and many friends had told me it was their favorite book. Unread, it held an air of mystery, of rebellion, and debauchery, and it seemed custom-made for an oddball reader fanatic like me. Well, unlike Special Topics, it was a quick read, and thank goodness for that because otherwise, I don’t think I would have made it. My initial, overwhelming gut reaction upon finishing the book was that I needed to punt Holden Caulfield as far from me as humanly possible. I despised him. It’s clear to me now that I didn’t understand him, and while, with age, I’ve grown more sympathetic, I’ve never completely shaken that initial distaste. I experienced the same thing a few years ago when I tried to watch Mad Men. It seemed like everyone I knew was flat-out obsessed, and I made it through about half a season before I realized that this just wasn’t for me. I remember getting into several heated debates over my refusal to give it another chance. Its supporters were shocked that I could fail to be magicked into that world – what I tried to tell them was that I had. I, in fact, had zero problem imagining that world, like Caulfield’s, smothering the hope right out of me, and I had no interest in returning to it whatsoever. When I read or watch something, I don’t mind if it makes me sad or anxious or angry sometimes. Books, especially, provide cathartic relief for an entire spectrum of emotions, and I love that about them. A book that makes me feel nothing is read and forgotten in the saddest way. The difficulty I have with a book like Pessl’s is that she didn’t write a single character I’d want to be friends with, and that, in a nutshell, is the test every novel or movie or show has to pass for me. I’m willing to put up with a whole cast of hateful characters if there is even one I connect with; in this case, although I felt badly for everyone in the book, I ultimately didn’t want to know what awful thing happened next. All I could think was that these pitiful, hurting, angry people were going to unravel in ways that destroyed the joy of everyone around them. The end result would be misery, and blame, and loneliness, and self-recrimination. We all have what my fangirl best friend calls a “squick.” In case you’re unfamiliar with this term, it implies a very personal revulsion to a particular type of circumstance; it does not, however, imply a judgement that said circumstance is bad or wrong – it’s just a knee-jerk reaction of repulsion. One of my major squicks is broken characters headed down awful roads into lives of spiraling misery. Many people find reading that type of story highly enjoyable, and that is a-ok with me. I just can’t do it. Maybe I’m selling Pessl short by choosing not to finish. Maybe if I labored on, one of these characters would surprise me. I’m happy to be spoiled in the comments by such revelations, but for the time being, I have to give this book a pass. For more about Marisha Pessl, go here. I spent about a week trying to decide whether it was ethical to write a review about a book written by Iain Grant, my editor for Ten to One, and Heide Goody, one of the judges for the project. Since I already published one for the first book (Clovenhoof) in the series back in March, it seemed worth exploring the reasons behind my hesitation and my ultimate decision to joyfully endorse Pigeonwings. The reason for hesitating is pretty straightforward. I’m the middle of a writing a book that also has an element of competition. (If you’re new to this site and have no idea what I’m talking about, I’ll throw you some context about Ten to One over here.) At the moment, we’re down to eight writers (out of the original ten), and the bar was raised impressively between Chapters 1 and 2. Do I want to be the last writer standing eight chapters from now? Of course. We all do. This made the decision to write a glowing review even more difficult. I blame this difficulty entirely on the fact that I was not brought up to believe I should do whatever was necessary to win. My parents had deeply entrenched beliefs about the ethics of competition in all aspects of life. We were to be open-minded, compassionate, hard-working; if we didn’t win the day with those methods, then we weren’t meant to win it at all. They stuck to those ideals, occasionally to their own professional detriment, and without a doubt, those lessons, taught almost entirely by example, stayed with me. They were harsh ones to learn too, since the disappointment of being passed over after putting forth an honest best effort is excruciating. I think what saved me from the heartbreak of the many (many) times I’ve learned that I am not the best or most valuable person in any given situation is that my parents didn’t tie self-worth to success; instead, I was brought up to believe two things: self-worth is connected to effort and intention – not results – and love is unconditional. What it came down to ultimately was that I didn’t want to write a review of Pigeonwings only because it felt a little funny to promote the work of people in a position of power over me. On the other hand, I think I may have unintentionally just defined what most people consider a form of networking. I’ve never been very comfortable with networking or self-promotion (as far as I can tell, most introverts aren’t), but I understand the value of it. What I understand even better, though, is the value of working with people who are good at what they do. I enjoy collaborating with writers who are talented, competent, and passionate. It’s easier to put aside concerns about conflict of interest when I consider how difficult it is to get a great book published, and how fortunate I am to be working with people who manage to do just that. It might make me a little uncomfortable to get out my pompoms and start cheering for this book, but to be honest, back in March, reading Clovenhoof was what convinced me to fight for this job. Finding these authors and loving their work has given me to the opportunity to work on a book I adore, and if that doesn’t earn them a little well-deserved recognition for their own literary efforts, I don’t know what does. Clovenhoof, who had been enlivening the quiz night at the Boldmere Oak by shouting out random wrong answers before he was kicked out by Lennox the barman, staggered home, turning each merry stumble of his hooves into a tap dance worthy of Gene Kelly. He tottered up the high street, not yet decided if he was going to indulge in a goodnight kebab, curry or pizza, and saw two shady looking figures outside Books ‘n’ Bobs. “There’s nothing worth stealing in there,” he called out. And it was. Ben and Michael were sitting on folding garden chairs, wrapped in winter coats and blankets, Michael with a clipboard in his hands, Ben with a computer tablet in his. “We’re doing a scientific study,” said Michael, a phrase that Clovenhoof typically understood to mean ‘spying on naked neighbours with a telescope’. As there were no neighbours, naked or otherwise, in sight, Clovenhoof was nonplussed. For more about Goody and Grant, head over here. First, a word of disclosure. This particular Oaks is my husband’s second cousin. We think. We’re nearly certain about it, in fact. He could be a first cousin once removed. At the very least, I’ve definitely met him at a family reunion; at the time, his precise connection to my mother-in-law didn’t come up in conversation (which is surprising, given how much her family enjoys discussing genealogy). As the product of two only children, I have given the technicalities of cousin-hood very little thought, and the only reason I mention it is because I feel it’s important to highlight any hint of author bias I might have when discussing a book. So, yes. I’m not a huge fan of biographies. I’ve only managed to read five or six in my entire life, and I was afraid that I would start J’s book and find that I couldn’t finish it. In my mind, that was the most disastrous thing I could do, because inevitably I would run into him again, and then how would I play it off? I can be exceptionally awkward when forced to lie, and what usually comes out instead is an ugly and blunt form of the truth. (You cannot even imagine the train wrecks I have endured when epically failing to lie.) In writing my character for Ten to One, however, I have started to do some research on bare knuckle boxing and the gambling that surrounds those fights. It occurred to me about a month ago that Why I Fight might be a great resource, so I girded myself and leapt in. As it turns out, it is a great resource, but it’s not a biography. I managed about two years of avoidance for nothing! Instead, it was a fast-paced YA/MG novel that I suspect could have great appeal for young readers who are struggling to find an appealing book. I don’t often find stories like that, and I’m always incredibly excited to be able to recommend one. Honestly, I can write a ten page list of books that are great for kids who love to read, but it’s much more difficult to narrow down the titles that can hold the attention of a child being forced to do it. I think one of our base desires is that we want other people to love the things we love; unfortunately, that just isn’t possible, and reading is often ruined for children (and adults) because those of us who are passionate about books have a hard time understanding where they’re coming from. The thing is, I’ve met plenty of people who don’t like to read (for a variety of reasons), but I don’t recall ever meeting anyone who doesn’t like stories. Some people prefer to get them from video games or movies, in the news or at the water cooler. They may prefer an auditory experience, or they may find themselves transported more easily into another world when they can take part in shaping the narrative. Personally, I like the privacy of the written word. I take great joy in soaking in the nuance of language, and I don’t have to struggle to create a world in my own head. Both nurture and nature were on my side there though. I never had to struggle to learn how to read, and I always had plenty of books available to me. My parents modeled a love of reading, and they encouraged me to read anything I wanted. I have such positive associations with books that it makes complete sense I would grow up to be a reader. Every person in the world doesn’t have to be like me in order to enjoy the occasional great book though. The trouble is, for many non-readers, books have often been thrown at them haphazardly without a side note of “Hey! This is a great book, but let me know what you think – if it’s not your thing, we can keep looking.” Many school librarians have told me this is especially problematic in their line of work; once children start falling behind on reading comprehension, books become the enemy. The thing that breaks my heart is that they miss out on stories that could mean so much to them – books that probably won’t be assigned on any curriculum, but which capture a cathartic experience. Why I Fight probably won’t end up on many summer reading lists, and that’s a shame because it’s a wonderful read. Its hero is passionate, and violent, and optimistic in his struggle against isolation and invisibility. It’s the kind of story I find myself wanting to give to kids who think there’s nothing for them in books. For more about J Adams Oaks, go here.